I love this baby quilt pattern! Our 5th grand baby is due in April!! Thanks for the great tutorial and fun blog hop....beautiful fabric! Your blocks are great.....like the first one!! That is such a COOL block. I can't wait to make it in red/white/blue!! Oh, I love your block!! Thanks for sharing and the template!! I can't wait to make one. I love paper piecing! Thanks so much for the excellent tutorial and free pattern. I like both blocks but the one with the green background is my favorite! I like the Friendship Star version. It gives more movement. Thanks for the PP tips. I love the two versions of the same block. Great illustration of how the fabric effects the final appearance. Thanks. Gorgeous block! Paper piecing makes things much easier. The block is lovely. Paper piecing gives such nice results. And the baby quilt is super cute! I like the first block. More contrast. I really need to try this block. Thank you for providing such a great tutorial. Nice work! I have tried paper peicing once, and I think I enjoyed it. Will have to try again. :) I prefer the darker background. I love the yellow background! So happy you made the paper pieced pattern and shared it. Thank you. Your blocks are beautiful and so is the ABC quilt. PS I subscribe to Inspired by Fabric through email. I like them both, but prefer the one with dark background and yellow points. I really like your patterns and have made a couple of them, and thanks so much for your tutorial and foundation! Lovin' this blog hop and subscribe by email to Inspired by Fabric and Morning Glory Designs. Both blocks are nice, but I like the original (green background) better. Thanks for the giveaway! Your block looks really awesome, but it also looks complicated. I am not a fan of paper piecing so I would have to do it the old fashion way. LOL I love the green fabric. Thanks for the giveaway. I follow Inspired by Fabric via GFC. Love your block and the fabric choices. You have made this block easier to construct. I look forward to making it. You blocks came out great--paper piecing isn't hard at all and I'm not sure why I don't do it more. I also like the alphabet quilt! 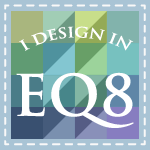 Liz you are the winner of a free 1 year subscription to The Quilt Pattern Magazine which will feature the ABC quilt starting in January. Congratulations!!! i love the bright green background for a toddler quilt, but I'm really drawn to the yellow for a baby girl quilt. I know, so pigeon holed but that is the way I am. Both are beautiful and thanks for sharing the pattern. I like the light yellow background star. I noticed the different center colors right away. Thanks for sharing the pattern and the giveaway! 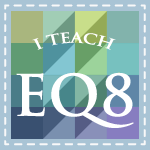 Nice way to use your EQ7. I prefer the dark green block. Higher contrast and I can see all the parts better. Guess I'm a high contrast kind of girl. Glad you made it back safely from Texas. I enjoy PP. I like both of your blocks, but I think I like the first block best. I guess it would really depend on the look or feel that you are going for in the completed quilt. I prefer the dark green background. It is a beautiful block with lots of interest. Love both blocks, but would probably make the first block. The the Alphabet Quilt. Have two young grandsons that would love the quilt. I love the dark background. It's so dramatic. Love the 1930's fabric and I like the dark green/blue background. 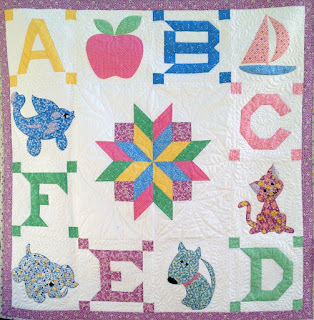 Thanks for the chance to win the ABC baby quilt pattern. I am a 1930's fabric addict. This is a great block. Perfect for paper piecing and of course your work is perfect. I like the block with the dark background best, the star is more defined! Your quilt is beautiful, thank you for the chance to win. Great block. Thanks for the paper pieced pattern. Both blocks are great. I think the green one is my favorite. Sweet block! I prefer the yellow background. Great blocks. I love the first one. This is a beautiful block. I prefer the star with the dark background. Thank you for the descriptive tutorial. I was wondering how you made the great points on your block! 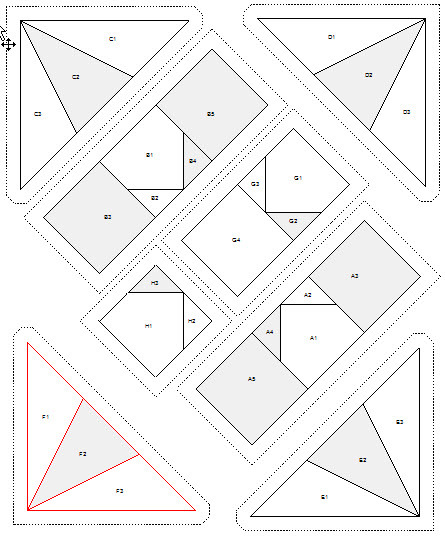 Thank you for the paper pieced template, and the detailed tutorial. I love this block. Though paper piecing has intimidated me, your tutorial helps tremendously! Thanks. Great block! I love the green background! Great block! I like the first one the most. 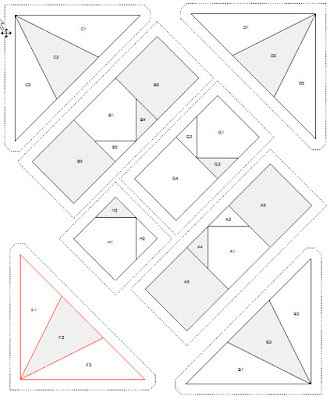 I haven't attempted much paper piecing yet but this gives me some incentive to try! 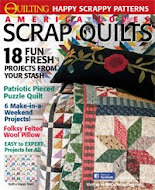 Would love to win this giveaway because I've been collecting 30's fabric for a while and the ABC quilt would be perfect! This was a fabulous tutorial! I am also very glad that you chose to create the pattern in Paper Piecing, I do not do set in seams. I absolutely chose the lighter colored background as my choice; it allows the whole block to shine in my opinion. I would be thrilled to win your give away choices, they are superb! Thank you for sharing all that you have and I hope that you have a fantastic creative day! I like the version with the green background best. Beautiful block--a paper piecing challenge for me! I love the second version with the extra green print. It really keeps the eye moving! Thanks for sharing this. 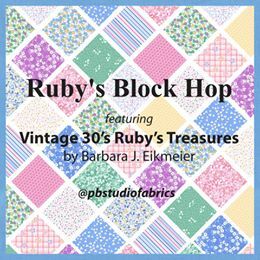 This block is perfect for paper piecing. Thanks for the pattern, the step by step instructions, and the tip to use tracing paper. It will be easy to find at the local office supply store. Your baby quilt is adorable too. 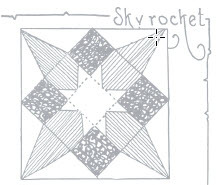 I haven't done paper piecing for awhile, but I may need to refresh myself with it to make this block as I love it! I like the yellow background block best, but both are so pretty! Thanks for the step by step info. That makes paper piecing easier. I make sample blocks when I need a break from my current project. Great tutorial. I like the first block with the green background the best. I like both,but i prefer the light background. Really like both versions, can't decide. Thanks. Nice blocks. The first one is my favourite.